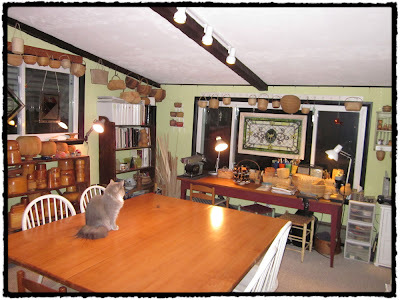 JASkets Blog: This House (or Room at Least) Is Clean! I thought I better take some photos while my basket room was still clean, especially my big work table. I don't think the top has been clear in months, what with Christmas card and gift making. Grayson, is happy to have the whole table top back to himself. My dad built me my big work table a few years ago. I love it, it is 5"x6" with plenty of space to spread out my projects. I designed it so that the base is open for storage. I have a couple of large clear storage bins with additional storage cases for my stamp ink pads, sewing machine, etc. My dad also made me the white shelves to hold clear storage boxes for my basket weaving supplies. I like to keep my materials sorted by size, so each box holds materials for a specific size basket. My Shaker and Nantucket molds fill up an antique bucket shelf. The walls are lined with baskets that I have made or collected. 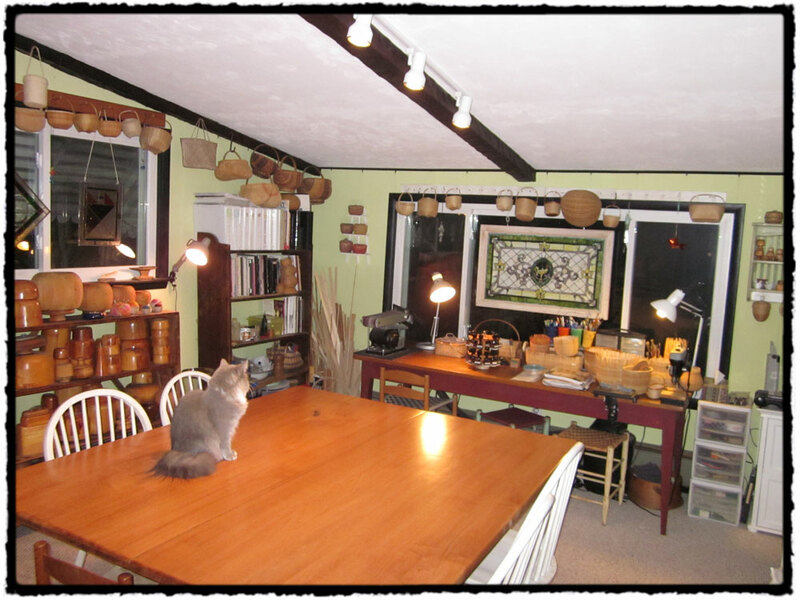 A few years ago I added track lighting over my work table. It really helps so much. I have a number of goose neck lamps that I can adjust for specific task lighting. 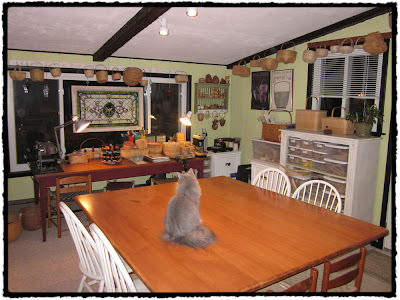 There is NO way I would post photos of my weaving room right now - LOL! It is a complete disaster or should I say full of creative clutter? That sounds better doesn't it? Like yours, mine holds other items as well, mostly wool for my rug hooking. At least the wool is organized! 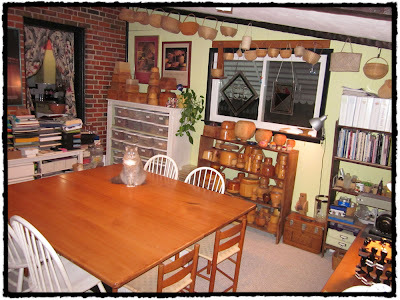 Love your big table - I can see friends sitting around that weaving and laughing. What a fantastic space to unleash your creativity! Your basket collection is wonderful and so beautifully photographed on your site. You've got my dream studio. Wow, this is beautiful, Tony. It is so nice to have things organized, it really does make me more productive.